Pawnee Bill Oil and Refining Company Check signed by Pawnee Bill and issued to Western Union Telephone Company issued in 1918. The check has the Pawnee Bill Oil and Refining Company name on top with an image of Pawnee Bill. This item is hand signed by t the President, Gordon W. Lillie aka.Pawnee Bill. 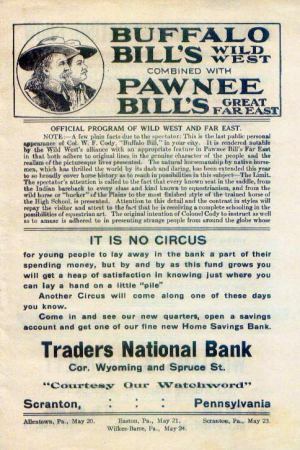 In 1908, Pawnee Bill merged his Wild West Show with the Buffalo Bill Wild West Show and the combined show became know as "Buffalo Bill�s Wild West and Pawnee Bill�s Great Far East Show Combined." As World War I neared its end in 1918, Maj. Gordon William �Pawnee Bill� Lillie entered the oil business in Yale, Oklahoma. Despite not being as famous as his Wyoming friend Col. William F. �Buffalo Bill� Cody, Lillie was �widely known as a showman, a teacher and friend of the Indian and finally as a colonizer in Oklahoma and builder of his state,� according his biographer. However, times were changing and public taste was turning to a new form of entertainment, motion pictures. By 1913, the showmen�s partnership was over and their show foreclosed. Lillie turned to other ventures � real estate, banking, ranching, and like his former partner Cody, the U.S. petroleum industry. Oil discoveries near Yale (population of only 685 in 1913) had created a drilling boom that made it home to 20 oil companies and 14 refineries. In 1916, Petrol Refining Company added a 1,000-barrel-a-day-capacity plant in Yale, about 25 miles south of Lillie�s Oklahoma ranch. The trade magazine Petroleum Age reported that for Pawnee Bill, �the lure of the oil game was too strong to overcome.� He founded the Pawnee Bill Oil Company on February 25, 1918, and bought Petrol Refining�s new �skimming� refinery in March. An early type of refining, skimming (or topping) removed light oils, gasoline and kerosene and left a residual oil that could also be sold as a basic fuel. To meet growing demand, refineries built west of the Mississippi River often used the inefficient but simple process. Lillie�s company became known as Pawnee Bill Oil & Refining and contracted with the Twin State Oil Company for oil from nearby leases in Payne County. By July 30, 1919, Pawnee Bill Oil (and Refining) Company had leased 25 railroad tank cars, each with a capacity of about 8,300 gallons. But the end of �the war to end all wars� drastically reduced demand for oil and refined petroleum products. By 1921, most Oklahoma refineries were operating at about 50 per cent capacity, with 39 plants shut down. Although Lillie�s refinery was among those closed, he did not give up. In February 1921, he incorporated the Buffalo Refining Company and took over the Yale refinery�s operations. He was president and treasurer of the new company. By June 1922, the Yale refinery was making daily runs of 700 barrels of oil, about half its skimming capacity. Pawnee Bill Oil company�At the annual stockholders� meeting held at the offices of the Pawnee Bill Oil company in Yale, Oklahoma, in April, it was voted to declare an eight per cent dividend,� reported the Wichita Daily Eagle. What happened next remains a mystery since financial records of Pawnee Bill Oil Company are rare, but a 1918 stock certificate signed by Lillie is valued by collectors (it can be found online selling for about $2,500). Lillie�s Wyoming friend Cody also formed several oil exploration ventures, including the Shoshone Oil Company. Tulsa, March 1.� (Special)�Announcement of the organization of the Buffalo Refining Co., which will operate what has been known as the Pawnee Bill Oil and Refining Co., of Yale, Okla., is one of the most important news developments of recent days in the oil world. The new organization is headed by G. W. Lillie, popularly known as Pawnee Bill, who will serve as president. Arch D. Grider is vice-president and Edward M. Weist is the secretary and general manager. The new company is incorporated for $100,000; will have its Tulsa office at 30 Nebraska building, and the operation of the refinery was to start today, with a full supply of crude and with what Mr. Grider says are "the best possible refining experts" in charge of operations. Mr. Lillie, the president, is one of the most popular and successful business men in northern Oklahoma. Mr. Grider, as all the oil world and much of the rest of the world knows, is a highly successful marketer of petroleum products. He will continue his marketing business, known as Arch D. Grider, Inc., but will devote much of his time and energy to the new company. The secretary and manager, Mr. Weist, will devote all of his time to the refining company's affairs and that means much, for he is one of the best informed oil men in the refining and marketing branches and his ability will go far in making the Buffalo Refining Co. the great success that it is predicted it will be by those who are familiar with the business attributes of the trio of men who are to guide the organization. No other Oklahoman exemplified "The Wild West" as did Gordon W. Lillie ...Pawnee Bill. He was born in Illinois in 1860 and became interested in the west as a child. He came to Indian Territory in 1875 and was appointed teacher for the Pawnee Indians in 1879. In 1883, Gordon W. Lillie joined the newly formed "Buffalo Bill Wild West Show" as an interpreter and performer. In 1886 he married May Manning, a 15 year old girl from Philadelphia he had met while traveling with the show. In 1888 Pawnee Bill formed his own "Wild West Show" and May became a very popular act in her own right for her marksmanship and riding. 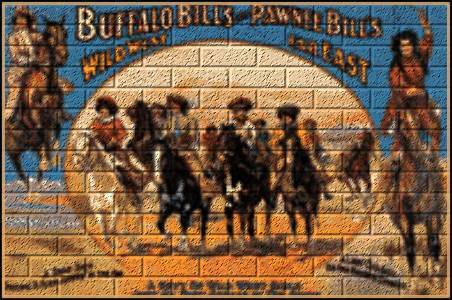 Pawnee Bill, always an entertainer and interested in preserving the Old West for future generations, built "Pawnee Bill�s Old Town and Trading Post" two miles west of his buffalo ranch. This tourist attraction was complete with rustic cabins to rent, restaurants featuring buffalo steaks, Indian dancing, Indian tepees and mud lodges, and buffalo grazing in the background. It was the scene of many large statewide celebrations for the boy scouts as well as other organizations and famous people. Old Town burned to the ground in 1944 and with it some of the finest objects of Indian art and artifacts of the Old West were destroyed. Pawnee Bill died in 1942, just eleven days before his 82nd birthday. Even in his last years, time that had whitened his hair had not dimmed the piercing grey eyes nor the spirit of this old frontiersman. The year before his death he still presented a lithe, immaculate figure in buckskins and wide sombrero. With his long hair touching his shoulder, he still was that picturesque character who, in a varied lifetime, had been a deciding factor in the settlement of the state of Oklahoma.